The second misconception about flipped learning is “flipped learning is easy for the teacher”. There is a tempting element of flipped learning that if the students are watching videos, and the students are doing homework, then the teacher is free to not have to do those things. That is only somewhat true. While in reality once you have established the framework and routines of flipped learning there is more time for the teacher in the classroom, but the true challenge is something the teachers have likely never experienced before. The challenge is that there is so much time in the classroom teachers don’t have enough to do with it. For anyone who has not flipped their classroom I’m sure this sounds absolutely foolish, but for those that have it rings one hundred percent true. The reason for this is that many of those limitations that we placed on ourselves in a traditional class format are gone, and now with new flexibility of time and space, there is an abundance of opportunity. The new challenge for a flipped teacher is how best to use this new time for effective and productive learning activities. What it really becomes is the problem of excess blessing we have so much time for awesomeness we’re not sure what to do with it. A second element to the “flipping is easy” myth is that since videos aren’t hard that must mean they’re easy. Making a single video of instruction for an activity or component of lecture or any other individual component as a standalone component is actually quite easy to do. What teachers either forget, or don’t realize, is that teaching is a marathon and while one step or one leg of the journey is easy, there is an element of compounding where we do not realize how many little things that we do over the course of a single day, over the course of a single week, chapter, or unit of instruction. When we start putting all of those individual and discrete components into a pile, that pile becomes larger and larger and larger. For every flipped learning element that we add, and every activity that we add to our flipped classroom, we add an additional layer of work in creation or organization. 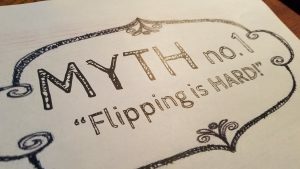 This means we must choose what and where to flip wisely, especially for those that are just starting, limiting what we flip initially to the basics and the framework until we have a firm footing and a little practice. I liken it to every pee-wee basketball team. The coach will put in a single play, and the team will run that single play in practice and in games until it can be done perfectly. Only then will the coach add a second, and then a third. They don’t add an entire playbook all at once because that’s overwhelming and far too complex to digest. Similarly I am reminded of the Shel Silverstein and how to eat a whale…one bite at a time. In the same way, teachers, like students, need an easy and guided entrance. By choosing to flip the most basic and fundamental components of instruction we get some experience in flipped learning and build our skills. Before long we will find ways to embellish and improve everything that we do until what results may look very complex, very in-depth, and will represent a great many hours of work and effort. Don’t let the hours and work required scare you, because just like any project worth doing those hours of effort and creation are hours that we’re proud to have spent because they reflect the best in us and provide the best of us for our students. I really wish I could convey this better to the new initiates as they are about to start their trip down this road. That sudden kick in the arse – that’s manageable if you expect – stops some dead in their tracks. Can’t agree more. The thing is the work is mostly enjoyable and has benefits of its own that are enjoyable but much like exercise there is a hump to get over first.